Day 1, Welcome to Burkina Faso, the "Land of the upright people"
Our tour guide will meet you at Ouagadougou International Airport. Transfer to the hotel. This morning you will be given detailed information of your trip. Our journey begins in Burkina Faso's capital city of Ouagadougou. In the morning we take a city tour to explore Ouagadougou’s sightseeing marvels. We visit the distinctive red-brick building of the Cathedral of the Immaculate Conception built in 1934. It has served as the centre of the Christian community ever since. From here we continue a bronze workshop.The bronze workers have different roles, including artists who shape the initial model out of wax, mould-makers who create a cast of the wax image and bronziers, who melt the metal and cast the object. Finally, workers smooth and shine the finish on each item. Later today we depart the capital and head towards the village of Laongo, lying 30 km east of Ouaga. This village features a garden with huge granite slabs that were designed by international artists. The outdoor gallery displays works of art carved in the rock formations by sculptors from across the globe who meet every year at Laongo to add more carvings. A big monument at the entrance featuring the differences between tradition and modern times was inaugurated in the year 2000 by Burkina's president Blaise Campaoré. A competent guide will explain the history of the sculpture park and some of the most important sculptures. At a short distance from the park there is the Opera Village, a project called into life by the late German filmmaker Christoph Schlingensief. The primary school, which is attended by 50 children from the nearby villages, was already inaugurated and the hospital is under construction. Furthermore, an opera house is to be built where in the future cultural events will take place. Convince yourself of the progress of the project and talk to the people who significantly contribute to its achievement. This morning we start our tour visiting the “Village Artisanal de Ouagadougou”. More than 300 artists exhibit at this arts and crafts centre and the quality of work is outstanding. You can see the artists at work and visit their workshops. Textiles, jewellery, leatherware, wooden sculptures, musical instruments and a lot of other handicraft are on sale. It is a non-stressful, hassle-free shopping. But don’t forget to negociate! Then we will leave Ouagadougou and its friendly people heading to Bobo Dioulasso. The road is lined with strange-looking baobabs and huge mango trees. On our way we stop at Sabou to visit the sacred crocodiles. In the early afternoon we will reach the bustling town of Bobo Dioulasso, Burkina's second-largest city. The country was named Upper Volta by the French after its three major rivers, the Black, White and Red Volta.The Republic of Upper Volta has since changed its name to Burkina Faso. It was renamed in 1984 by President Thomas Sankarato mean "the land of upright people" in Mòoré.A name that suits the population, because people are helpful, friendly and open minded. In the afternoon, we arrive at Bobo Dioulasso, which was founded in the 15th century when the first people settled in the area. It was then called Sya. Bobo Dioulasso means “house of the Bobo and Dioula”, after the two tribes living in the area. Today Bobo, as it is affectionately called by its inhabitants, is the country’s most important commercial centre and capital of music. After check in to our hotel, you will have free time to explore the modern part of the city of Bobo Dioulasso where the "Auberge" is located. Its centrepiece is the vibrant Grand Marché which burnt down in 1998 and was rebuilt in 2001 in neo-Sudanese style. You may have a stroll through the bustling market hall with its fruit and vegetable stalls, meat and fish sections. In another part of the huge market household wares and colourful fabrics are sold. As the market cannot accommodate all vendors, it spills over onto the surrounding streets. There are also curio shops for tourists with souvenirs on sale. It offers a good opportunity to buy masks, sculptures, bronze or jewellery. Pottery you’d better buy on the pottery market close to the old town. Next to the market, you may visit Bobo’s impressive cathedral and from there you reach the extravagant train station. During colonial times the French had planned to connect Abidjan with Niamey, a vision they could never put into practice. Due to the beginning of World War II and increasing costs they had to abandon their project, so the railway could only be constructed from Abidjan to Ouagadougou. Trains from Bobo to Ouagadougou are still running today. The station was built in 1934 in colonial architectural style. In the morning we start our city tour with the visit of the magnificent Great Mosque, built at the end of the 19th century by the religious leader Almamy Sidiki Sanou. It is Burkina’s largest mosque and may be visited by non-Muslims if accompanied by a guide. The mosque can accommodate hundreds of worshippers. Climbing up one of the “sugarloaf” minarets we reach the top of the mosque to see the clever ventilation system consisting of many holes in the roof which in the dry season provide light and fresh air and during the rainy season are covered with individual little clay caps to prevent the rain getting in. Across the road from the mosque, we enter the old town, known as Dioulassoba. It has four quarters, an animist and a Muslim one, as well as the quarter of the griots and the one of the blacksmiths. During our walk through the old town we’ll see fetishes of the animists, we’ll be introduced to the art of brewing millet beer, discover the sacred catfish in the Houet river and meet the town’s blacksmiths and bronze artists. After our visit we leave the charming town of Bobo Dioulasso heading to Banfora. The drive takes one and a half hours. Banfora is surrounded by lush sugar-cane fields and offers some outstanding tourist attractions which we will discover this afternoon. Near the town lie the amazing Domes de Fabédougou. On arrival at Banfora we make a short drive to visit this miraculous nature wonder. These lime stone formations which were formed some 1.8 billion years ago, seem to be otherworldly. During the Tarkwaian era, the whole area was covered by an ocean. Sediments have been laid down, over time they turned into rocks of differing hardness. Due to erosion caused by wind and rain, the softer layers were worn away leaving a unique landscape of stone sculptures. We walk through the stunning scenery of sugar-loaf shaped or mushroom-like rocks and formations resembling pyramids to reach the picturesque Karfiguela falls, which consist of several distinct cascades. This is one of the most famous natural tourist attractions in Burkina Faso. From the top we enjoy the spectacular view over the lush valley with large orchards of mango trees. We stop and take breaks along the way at each of the cascades. At the bottom, there is a natural pool where we can swim and rest in the afternoon. This morning our journey takes us to the small town of Sindou, located about 50 km from Banfora. The magnificent, otherworldly Sindou Peaks are one of Burkina’s most spectacular landscapes. This is Senoufo country which straddles the Burkina-Mali border. Mount Tenakourou, at 749m the highest point in Burkina Faso, is in the area of Sindou, tucked up against the Malian border. The Senoufo consider this fascinating wonderland of Sindou sacred and initiation rites are held in this place. Coming from Banfora we have a fantastic scenic view of the spindles of sandstone rising into the air. We spend today walking through this labyrinth of remarkable rock formations and remote Senoufo villages accompanied by an experienced local guide. In the afternoon we continue our excursion to the nearby lakeside village of Tengrela. Boatmen will take us out on to the lake in a typical pirogue – a local wooden canoe. The lake offers a good opportunity to spot hippos. The Senoufo consider the hippos sacred therefore they live in harmony with the animals. This herbivore lives in herds of about 15 animals presided over by a dominant male. The shores of the lake are home to numerous bird species. African jacanas run on the water looking for prey. Pied kingfishers dart into the water to catch a fish and colourful bee-eaters sit in tree branches. White water-lilies spread out theirs leaves over the water surface like a carpet. They shine in the setting sun. Towards evening we return to our hotel at Banfora. This morning we head east. En route we stop at the ruins of Loropeni, since 2009 Burkina’s first UNESCO World Heritage site. The amazingly well-preserved 7m high and 1.5m thick walls of the ancient site stand up in the middle of a cool forest. Little is known about their origin. Some presume that they date back some centuries, but until today historians and archaeologists could not agree on the construction date and the purpose of the place. It may be the enclosure of the courtyard of a king’s palace or an ancient settlement linked to the tradition of gold mining. These are only two of the theories which might explain the existence of the ruins. At Loropeni we have reached the land of the Lobi and spend some time with a local guide, making the most of the opportunity to learn a little something about this ethnic group. The Lobi make up about 7% of Burkina’s population, they are also found in the north west of Ghana and Ivory Coast. In Burkina Faso we find their settlements around the town of Gaoua. We stop near the town of Loropeni to visit a typical village and become acquainted with the Lobi’s traditions. They still adhere to many of their traditional customs and animist practices, worshipping wooden fetishes and continuing to hold fast to their age-old beliefs. 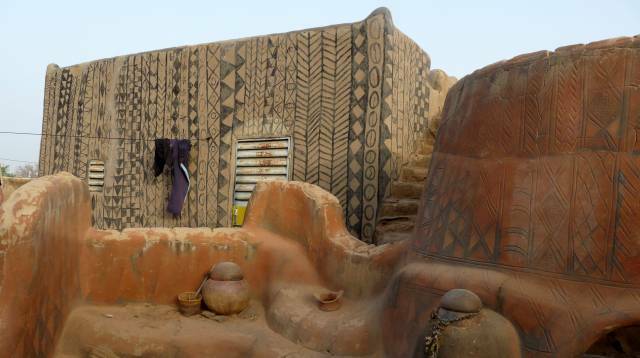 Their large mud houses, known as soukala, are similar to miniature fortresses, an architectural style they once developed to defend themselves against attacks from their enemies and wild animals. Their compounds are constructed well away from each other, which is another protective measure. In the past the Lobi were traditionally hunters and fishermen, nowadays they are farming and raising livestock. After visiting these usually reclusive people we continue our journey to the town of Kampti and the nearby village of Kouekouera where we meet a healer, who is at the same time a feticheur and a diviner. Many wooden statues stand in the healer's courtyard and the houses. They represent the spirits that he consults on all kind of questions. From Kampti we head to Gaoua, the capital of the Lobi country, which we’ll reach in afternoon. At the surprisingly well presented ethnographic museum Musée du Poni, we will have an opportunity to discover more of their remarkable history and traditions. A knowledgeable guide will show us the artefacts, statues, musical instruments and hunting weapons. A number of black and white photographs taken during the 1920s and 1930s allow us to get an informative image of the Lobi culture. In front of the French colonial edifice there is a small open-air museum featuring the interesting Lobi architecture. Today we continue our journey heading north-east. Our destination is Nazinga Ranch which is home to a huge elephant population. At the waterhole near the camp we can watch herds of elephants coming to drink and bathe. But be careful: sometimes the hairy beasts walk through the camp! Along with elephants, who are doubtlessly the star attraction of the reserve, 38 mammals are found at Nazinga Ranch among them more than 500 buffalos, as well as antelopes, warthogs and several thousands of primates. The park is also a good place for bird watchers, as it is home to 275 species. Today the protection area is 94,000 hectares. It was established in 1979 by the Canadian brothers Robert and Clark Lungren, who grew up in Burkina Faslo. The late afternoon is the perfect time to spot the animals and take fantastic pictures! Enjoy the real “Out of Africa” atmosphere! In the early morning you have one more opportunity to see the wildlife which lives here and observe elephants. Then our drive takes us to Tiébele via Pô. Tiébéle is a small town east of Pô with a population of approximately 18000. It is the best place to see well-preserved Kassena houses. Passing villages contain the first hint of the magnificent architecture to come. We start our visit at the Royal Court, the chief’s compound where more than 400 family members live. The houses are decorated with a repetition of geometric signs. They are circular, square ore figure-eight-shaped depending on the status of the occupants. Round huts are for bachelors, rectangular houses for newly married couples and the figure-eight-shaped dwellings are for grandparents and grandchildren, with connecting circular chambers. The hut-painting is done by women. Every year, at the beginning of the dry season they renew the expressive decoration. The black colour is made of a mix of pounded graphite and volcanic rock and the white colour of soapstone and calcium. The red paint comes from kaolin. The wall coating is made from earth, cow dung and ash. They apply the geometric patterns onto a final base layer which contains pounded laterite, water and boiled seeds of the nere tree using brushes fashioned from the feathers of guinea fowl. Each pattern represents a symbol, the most popular symbol is the calabash which is extremely important in a Kassena woman’s life. It is used as a drinking goblet, paint-pot and receptacle for sacrifices and retains its importance beyond death. By tradition, a calabash will be broken on the fourth day after a woman dies. From Tiébéle we continue north to Ouagadougou which we reach in the late afternoon. Today we leave Burkina's capital heading east to Pama across the tribal heartlands of the Gourmanche. En route we have time to visit one or two Gourmanche compounds lining the road. This ethnic group lives around the towns of Pama and Fada N’Gourma. Animal husbandry is much common in this poor region and the Gourmanche are also known as skilled hunters. At Pama we turn into a dirt road to reach the Lake Kompienga formed by a huge dam built in the village of Kompienga between 1985 and 1988 to create a water source for the hydro-electric station at Tagou which supplies most of Ouagadougou's electricity.The Oualé River, a tributary to the Pendjari which forms the border with Benin for some distance, is dammed here. The lake alos plays an important role in the fishing industry of the region. We take a boat ride to get to the small island on which our hotel is located. This morning we leave the island and take a boat ride back. In the afternoon we return to our hotel where you can use day rooms until the transfer to the airport. Our tour ends this evening. After two hours we reach Fada N'Gourma, one of Burkina's larger towns, where we stop to see Madame Mariam, who sells delicious honey and bee-wax. She explains us how apiculture is practised in the area which is famous for its honey. In the afternoon, we reach Ouagadougou where the tour ends. In the evening transfer to the airport. Please note that from time to time our itineraries may be amended.